The wind howled most of the night but we slept well. Our wonderful tent kept us warm with its elevated, thin Silnylon panels. When we awoke we were happy that nothing was wet. 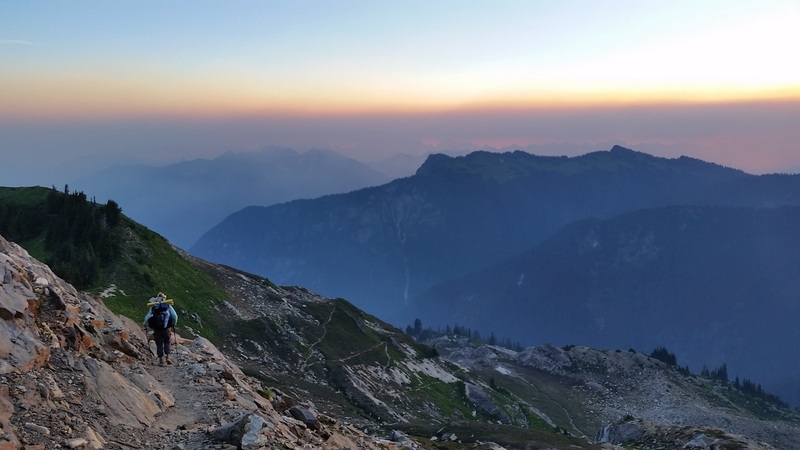 Being above tree line condensation was a concern. When Andy went to retrieve our Ursacks he noticed one of our sit pads was missing. He hoped it hadn’t been carried too far from our tent by the wind. He found it in a drainage about 100 feet from our campsite. 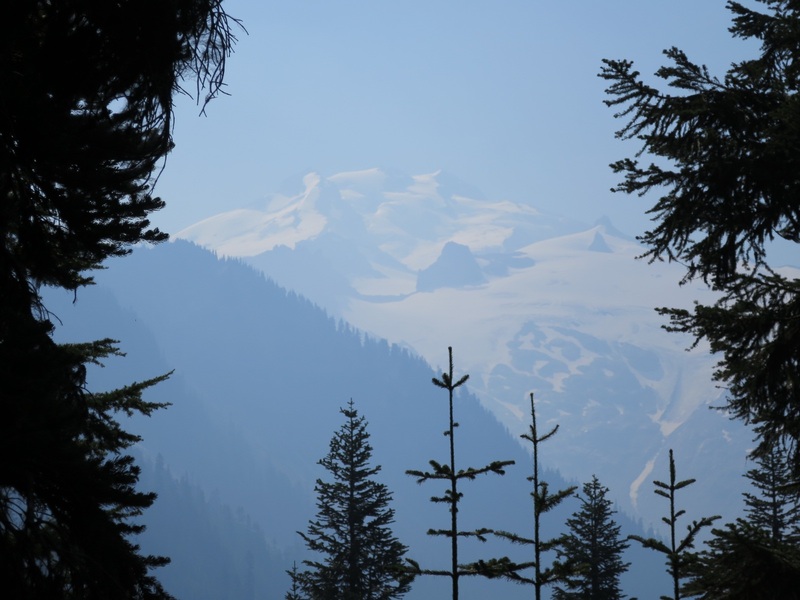 When we left camp around 6:20am the air was smokey and many of the glorious mountains surrounding us were blanketed by haze. Today it smelled like there was a fire nearby, much more than yesterday. We weren’t very concerned though – at least Andy wasn’t. As we switchbacked down to Mica Lake we discussed whether we should have an exit strategy. 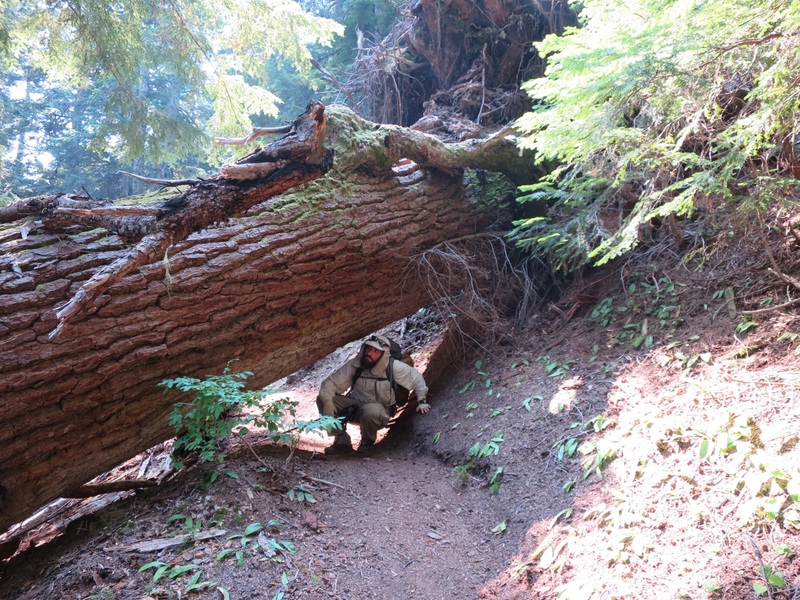 It’s instances like these when a larger Forest Service map comes in handy. 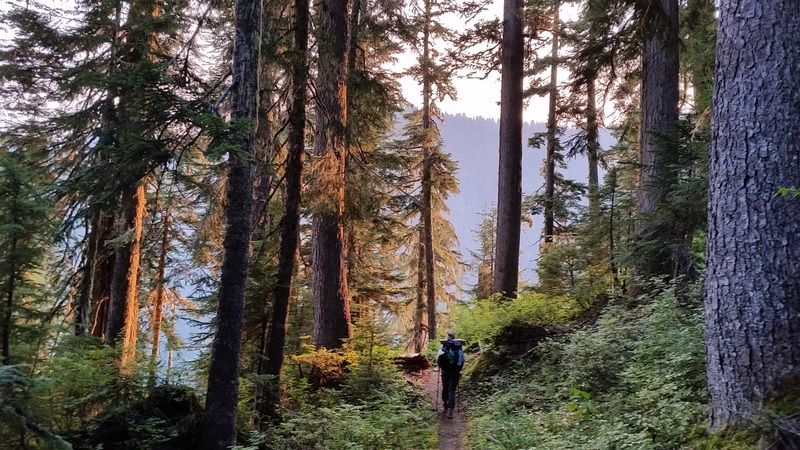 Our apps and Halfmile maps cover the PCT but don’t offer much in the way of where side trails and Forest Service roads lead. The smoke made for a beautiful sunrise, the sun blood orange and already relentless. The mountains surrounding Mica Lake were being kissed by the sun when we got there. We were glad we camped where we did because there were lots of people camped near the small lake. Who can blame them? Mica Lake is really pretty. 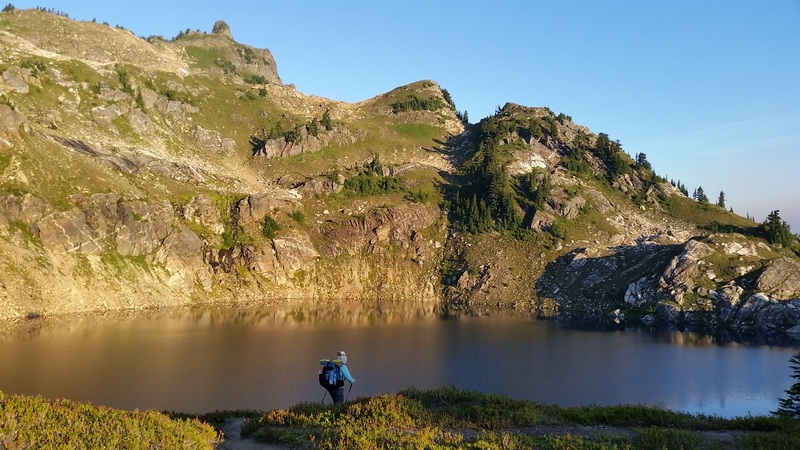 It reminded us of our favorite alpine lakes in the Sierra Nevada Mountains. One of the people we met today was Sauté. 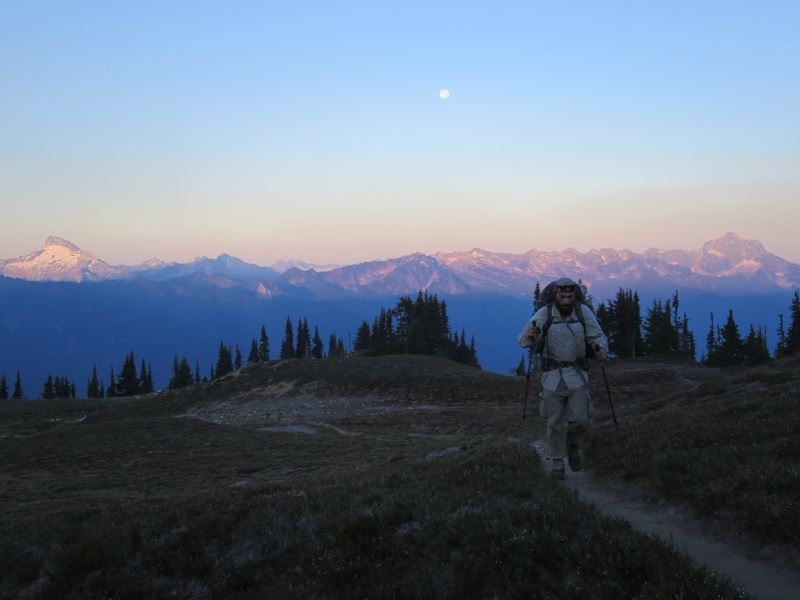 He is section hiking Washington and dealing with lots of gear failures, his water filter being one of them. We gave him some Nutrasilver colloidal silver to purify his water as we had extra. Hopefully this relieved some of his worries. Past Mica Lake we descended our second series of many switchbacks to come (the first set were descending to the lake). 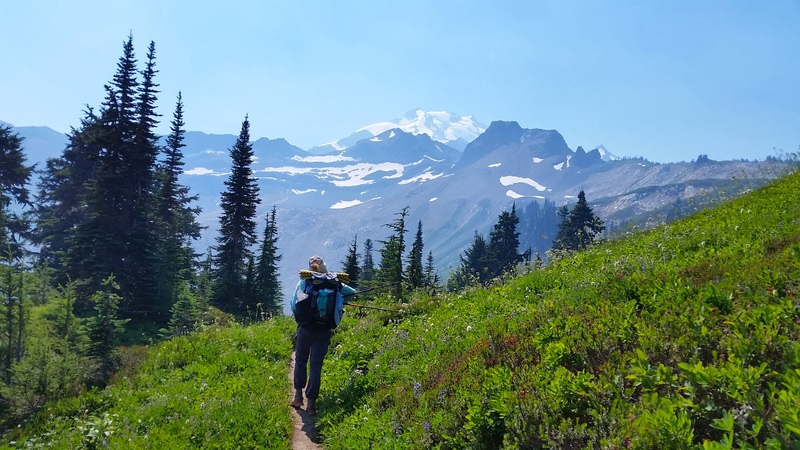 We were sightly worried about today because we were already tired and were facing a 25 mile day that included 6,000+ feet of elevation gain and over 9000 feet elevation loss. Halfway down our worries were relieved since the switchbacks were gently graded. The miles came easy, except for the times when we had to steeply ascend or descend use trails to get around downed trees. A few switchbacks before we reached Milk Creek we ran into Billy Goat hiking southbound! Billy Goat is a hiking legend and someone Andy has talked about often on this hike. He is in his 80s and has more than 40,000 PCT miles under his feet. We chatted for about 15 minutes before going our separate ways. Billy Goat walked with a slight limp and had a very genuine smile – the type of smile that comes from a content heart. As we parted ways we took a few steps and turned in his direction, smiling with admiration, only to find him turned around looking towards us with a similar smile. After crossing the very fast flowing Milk Creek (Creek? Really? This thing was raging!) we then climbed over 3000 feet on gently graded switchbacks. At times it was hard to breathe given the smoke. 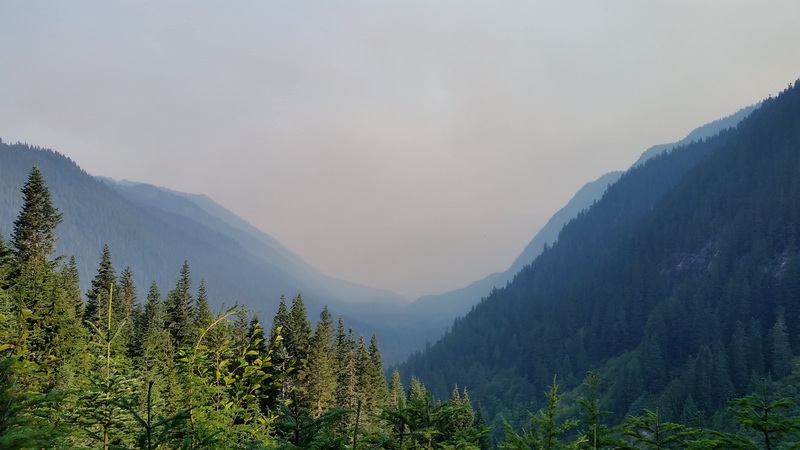 The abundant thimbleberries helped Andy forget about the smoke, but the same can’t be said for Laurie. She felt robbed of views. And that she had lost and other people ahead of us had won because they got to see the views and we didn’t. He’s a voice of reason but sympathizes with Laurie’s feelings. We did all the hard work the last few days to be here, but we don’t get to see any of it. All we can do is accept that this is what we’re encountering and enjoy what we can. 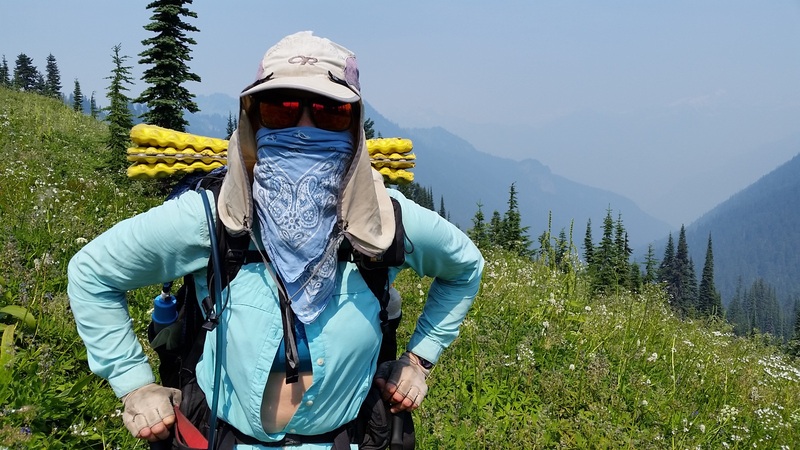 Laurie’s nose was burning and her lungs were feeling irritated from the smoke, so she tied her banana over her face, resembling the hiking bandit. This didn’t last long though as her dark glasses kept fogging up with each breath. On our descent we met and hiked with Bonus Miles. Fires forced him out at Stevens Pass last year. 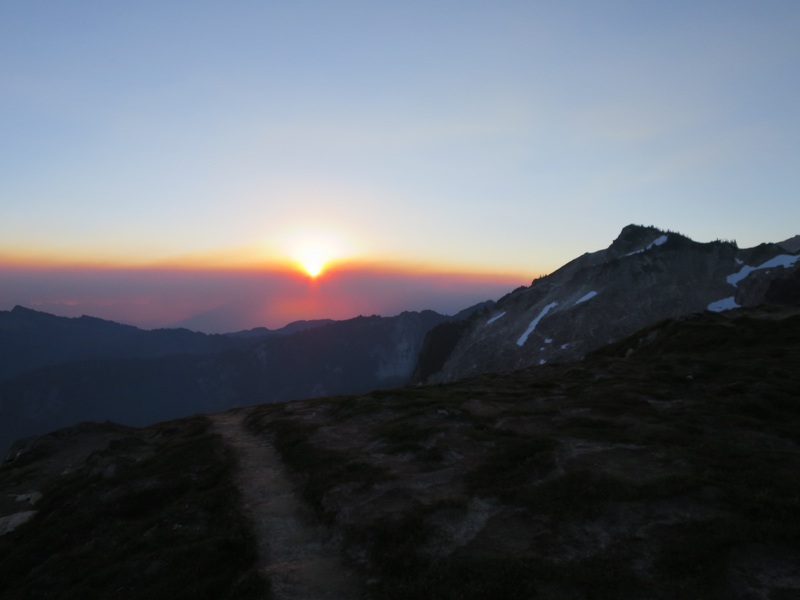 He’s back to finish his thru hike from Stevens Pass to Stehekin. 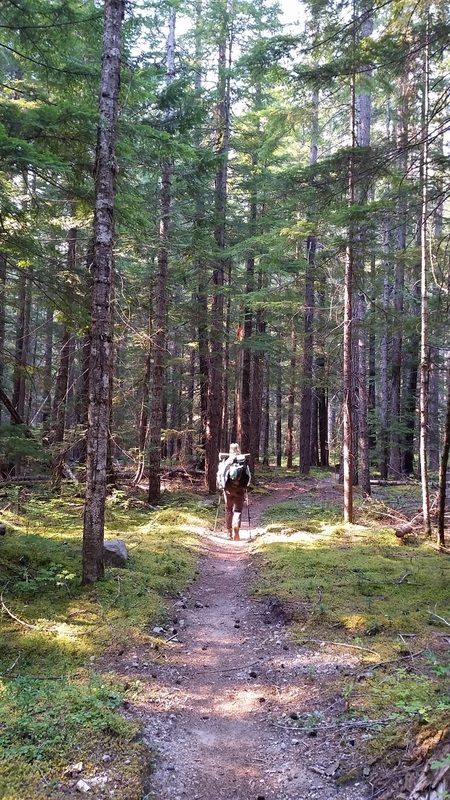 We traded stories about the trail and our experiences, and introduced him to thimbleberries. 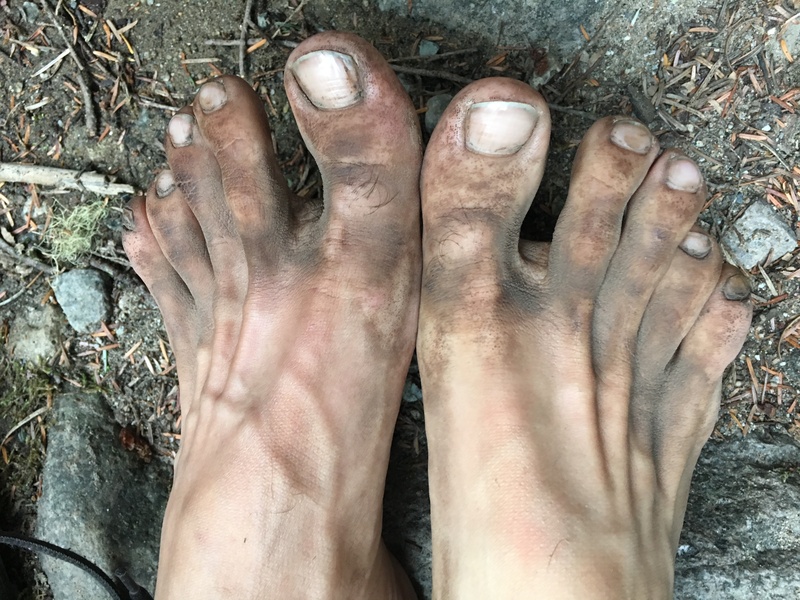 His feet hurt because he hadn’t hiked much before this trip, so we parted ways when he stopped to soak them in a creek. We continue to meet people from all walks of life out here for different reasons. It’s great! We continued our long descent to the Suiattle River. 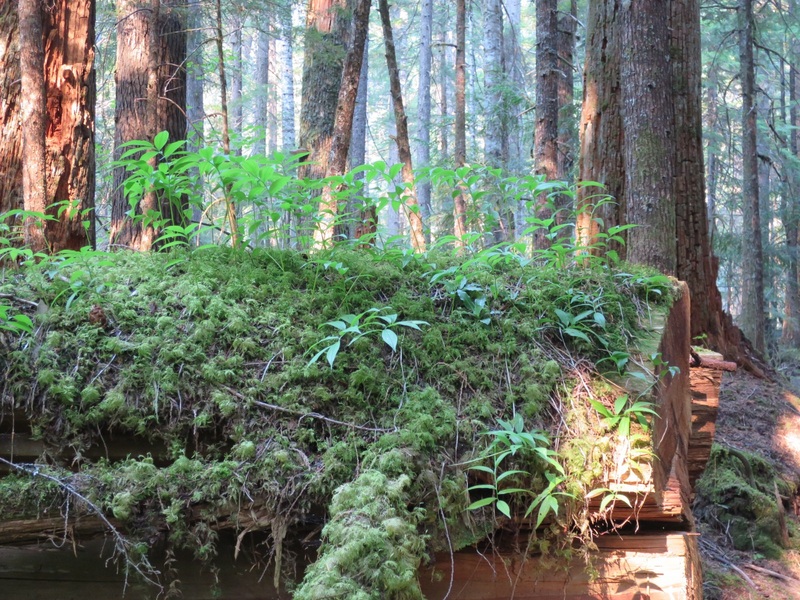 The old bridge washed out a few years ago, and getting to the new bridge included an extra 7 miles of hiking. At first we were annoyed but later it made sense. The river was fast flowing, silty and very wide in some places. At least the 7 mile detour was scenic. 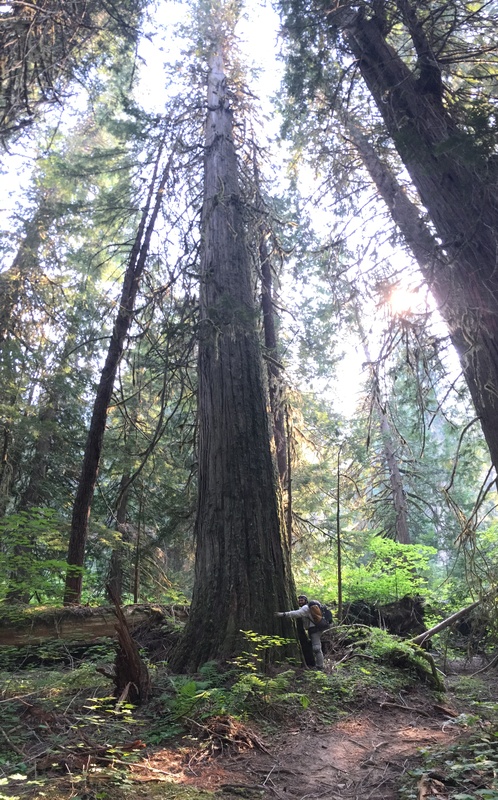 We walked through an old growth forest with huge trees. Andy hugged one of them and his arms didn’t even go a third of the way around! We enjoyed a cheese break once across the bridge. Well… we enjoyed it as much as we could. It was another hot day and at 2000 feet it was muggy. Laurie was hot and uncomfortable. She was struggling. It’s been a rough section for both of us, but battling the heat was taking its toll on her. Hopefully cheese and candy help! They can’t hurt right? After 15 minutes we were ready to go. The flies have been horrible lately, making breaks unpleasant. Particularly when we get covered by biting horse flies. We smiled too anticipating what he’d say next. 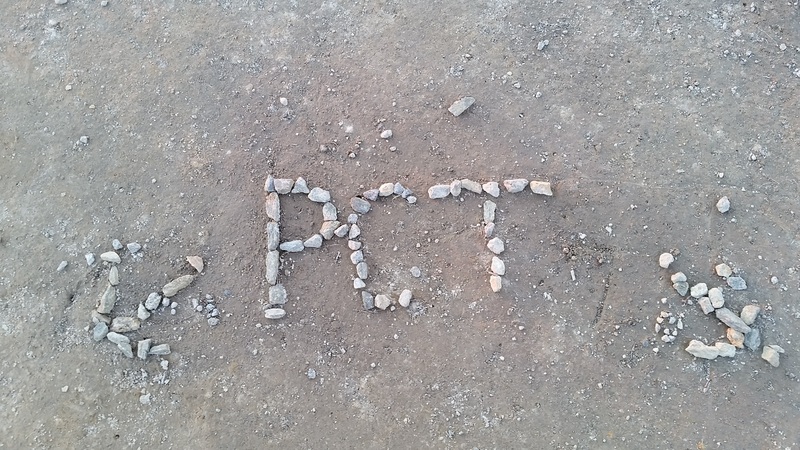 Ed (trail name Enoch Sir Peanut Butter) has been following our hike since the beginning. 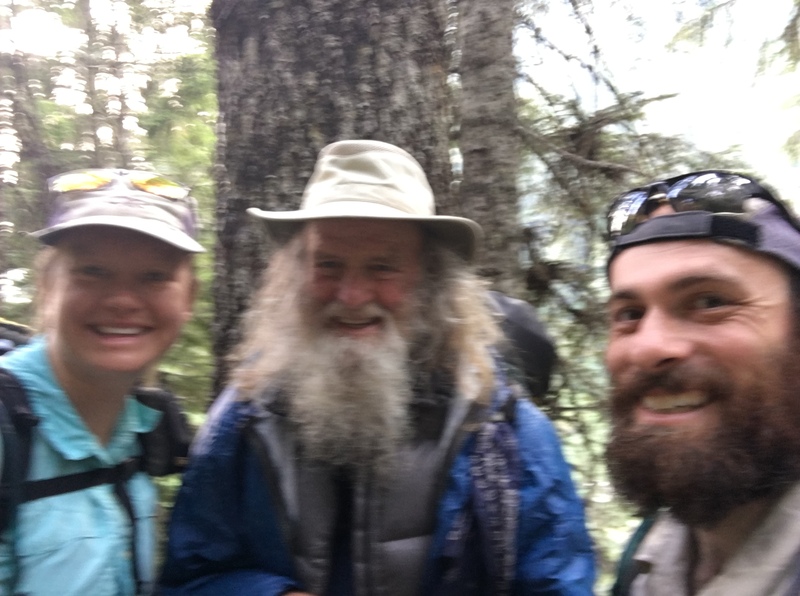 He is a very friendly guy hiking with Bonus Miles from Stevens Pass to Stehekin. We love running into people who read our blog. Ed thanked us for journaling on a regular basis. He also told us he really appreciates how we end each post with two things we are grateful for. We cleaned off in the cold creek, made dinner and went to sleep around 10pm with the creek keeping us cool and the breeze keeping the flies and mozzies at bay. Tonight we are grateful for gently graded switchbacks and our healthy lungs. Yup. 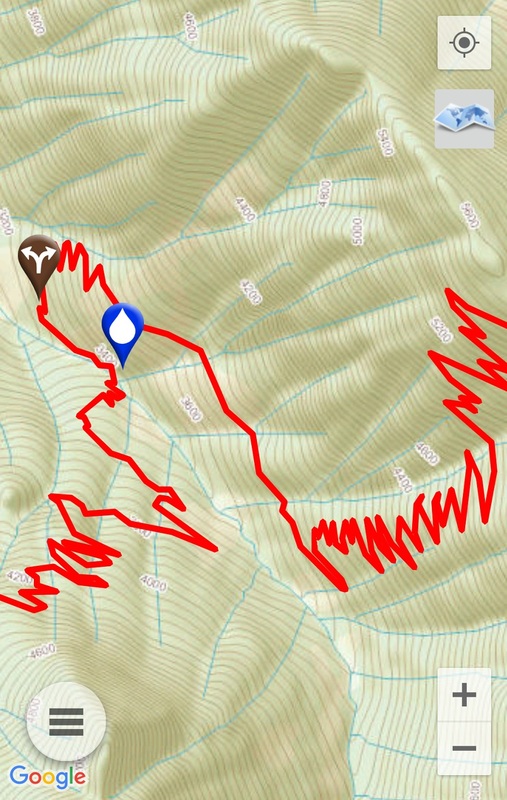 That red line is our trail! When in doubt, hug a tree! We get dirty out here! Did I miss something? Are you engaged? May love spring eternal!